The year is officially half over. We celebrated the occasion by sleeping in, cooking hamburgers, picking up pierrekrahn and going for ice cream, grinding out an achievement in World of Warcraft and then rounding out the day with a ride down to the park. 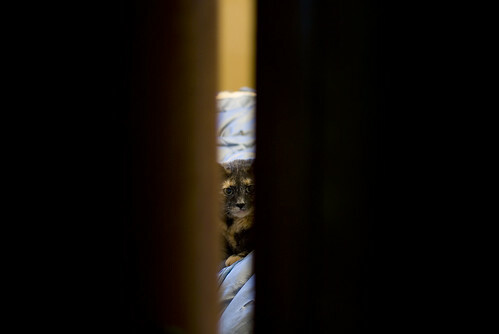 Somewhere in the course of that busy day I found time to snap a picture of Merry peeking at me through he bedroom door. I was worried that Merry might move while I was busy setting up the tripod, but the noise and motion kept her intrigued. I shot this one at 1/3 of a second, with an aperture of f/2.4. I could have gone with a wider aperture and shorter shutter, but I didn't want to entirely blow out the depth on this one. Other than the usual colour correction and sharpening (both minor tweaks), I tilted the image to correct for the fact that in my haste to get the shot I did not have the tripod level. Finally I created an overlay and darkened the area outside of the crack in the door to enhance the contrast a bit. Behind the cut is evidence that I have no life. 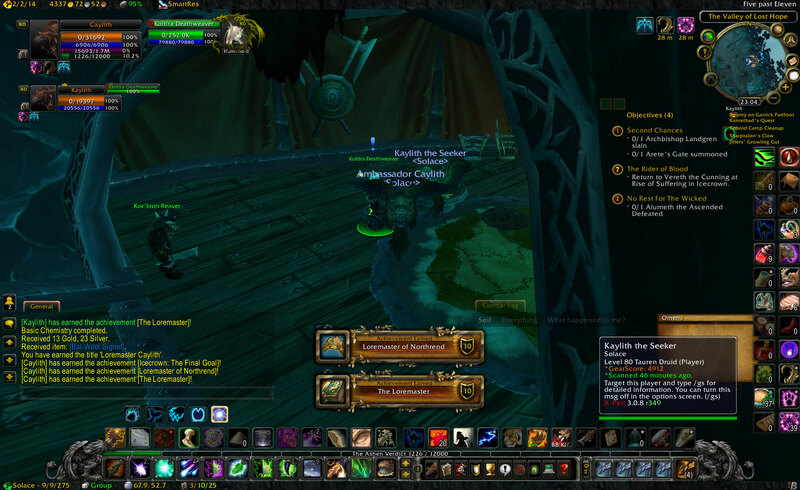 This is my second character for whom I have ground out this excruciating achievement. I don't know why I did it; to see if it could be done, I suppose. I also wanted to see if it would be easier to do with a new quest-tracking add-on I had installed a couple of months back. It was still a long grind, but the difference was night and day. At this point people familiar with this game are probably going, "Dude, are you two nuts?"